EU integration of Visegrad members has been a reality for the last decade. Still, cultural cooperation remains a highly sought after goal among Central European countries. The film industry in Bratislava usually has turned to partners in Prague whenever it embarked on ambitious cinematic projects. Nowadays, a number of movers and shakers have tried to stir things up by knocking at the door of other neighbors. Slovak producer Michal Kollár is one of those. Kollár produced Marcin Koszałka’s beguiling serial killer movie Red Spider (2015) in Krakow and afterwards went on to complete The Red Captain, adapting a novel of the same name from Slovak crime stories hero Dominik Dán. Kollár signed Polish thesp Maciej Stuhr for the main role in his directorial debut set a few months before the dissolution of Czechoslovakia. Stuhr proved to be a hard worker, having confessed he spent 19 hours in one day on the film set to model the character of the Detective Krauz, called here to investigated an intricate case of murder from the Communist period. The epochal shift to capitalism is a merely decorative background to a story that turns into a visual penny dreadful on the big screen. Kollár approaches historical events with the same flippancy shown by Detective Krauz caught doodling on the cover of Czechoslovakian phone book’s last ever edition. 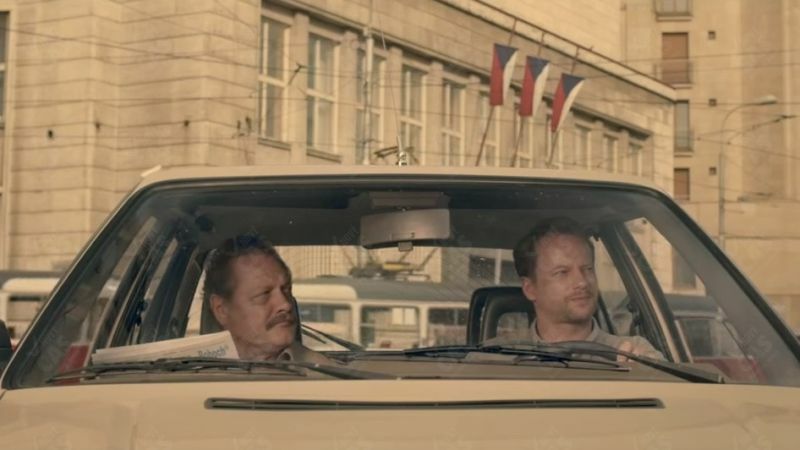 Just like the characters of Władysław Pasikowski’s earlier films, local national security bureaucrats are aware of finding themselves in a grey area. They fear their inadequacy in a transitional era in which the lasts vestiges of Communist system are soon to disappear. Nonetheless, the character tailored by Stuhr lacks the richness of existentialist tones as seen – for example, in Bogusław Linda’s performance as Franz Mauer in Pasikowski’s Pigs (1992). The Polish press has been quite indulgent on this occasion, maybe due to Stuhr involvement in the movie. On the other hand, Slovak commentators are certainly not eager to tear into shreds a movie which used 380 special effects scenes, establishing a local record for the Slovak film industry. Still, artistically speaking, it is reasonable to expect more from the Visegrad cinematic co-productions to come.